Purple Majesty Salvia (S. guarantica x gesneraeflor 'Purple Majesty'') - Dark rich purple blooms are a Hummingbird magnet. 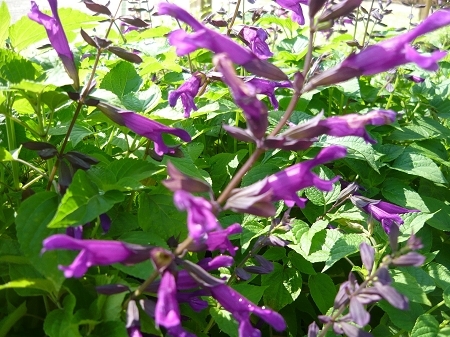 Grows approx 3' x 3' with large lush green leaves and loads of Large tubular shaped dark purple blooms Spring through Fall. Perennial zones 7-11 Live plant in 3 inch container. This was an afterthought when I purchased Hot Lips. It's 4 feet tall and beautiful. Hummingbirds enjoy it.